Jane Goodall has pushed me too far. DISCLAIMER: I dig chimps and other primates and we ought not be testing shampoo, make-up, or any other toxic waste on them. 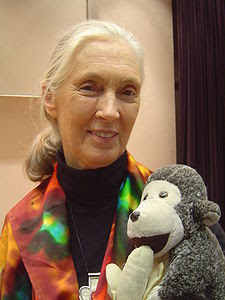 I grew up reading about Jane Goodall - I can remember reports about her work with chimps in the National Geographic we got at the house when I was but a wee one. Just read an interview with her in the latest Readers Digest that tripped my freakin' trigger. "RD: Can you sum up what you have learned from 50 years of living among the wild chimpanzees? JG: A little humility. We humans are unique, but we're not as different as we used to think. Between chimps and humans, there is only about a 1 percent difference in DNA. Our biggest difference is our spoken language, which has enabled us to develop culturally in ways that chimpanzees have not." Okay Jane - I gotta differ with you here. I can think of a lot of bigger differences other than our spoken language. A review of Terro ant bait vs Raid - Terro wins big time. We always get some ants in the late spring/early summer at our house. It is an annual tradition. Usually they are around for a week or two and then they take off for parts unknown. This year they must have decided our house is a very, very, very fine house indeed. Found them in the sugar, they massed in the dishwasher, but when I poured out a few dozen of them along with my cereal one morning, I knew I had to draw a line in the sugar. Time to poison the little bastiges.